From a developer viewpoint, Look'n'Stop is a great personal firewall. Even their design may not very clearly for the normal user, but if you have enough background knowledge, it can be a powerful analyzer for the security threats. Fortunately, they provide some plugin API for log display and rule editor. Through those interfaces, I can pop up my dissector dialog to display the protocol tree of packet. To avoid reinvent the wheel, I choose Wireshark as background dissector. 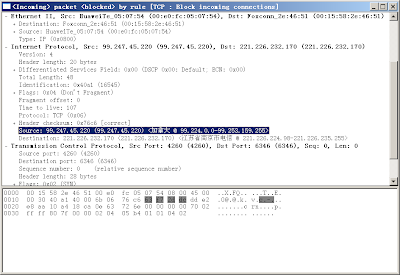 Because Wireshark, or more well know name - ethereal, is the best open source network protocol analyzer, and is the standard in many industries. Even Wireshark has encapsulate all dissector in a library, its interface not clearly and stable, so I decide use its terminal-based edition - tshark, as the major dissector, because it can read packet from stdin, and dump the protocol tree to stdou as XML format. You can select a field in protocol tree, and the corresponding data bytes will be highlight in the bottom editor. If you want to save the packet for more analyzer, just right-click the windows title, and choose "Save As" in system menu. it support save packet as libpcap, xml and text format. If you input a valid path, plugin will fetch the version and copyright from tshark, and save it to registry to reuse in future. 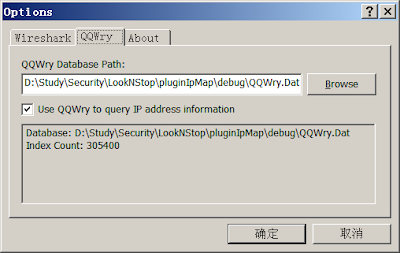 After you choose "Use QQWry ...", a location information will be appended after some IP field in protocol tree. If you have interest about this, please download the prebuild binary or compire it by youself.